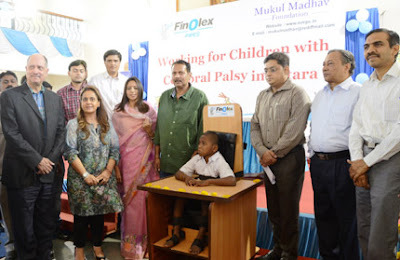 With a view to provide overall support to children affected with Cerebral Palsy, Mukul Madhav Foundation is to open a Consulting service at the Ruby Hall Health Care Services in Satara where these children can avail benefits of a tele-rehabilitation program, to get the guidance from experts of KEM Hospital Pune, via video conferencing. the shortfall of specialized doctors such as pediatric neurologists and psychologists whose guidance is essential for the treatment of these children, announced Mukul Madhav Foundation’s Managing Trustee Mrs. Ritu Chhabria on Friday. MMF would like to thank Dr. Purvez Grant from Ruby Hall, who has generously offered this space to them without any charge and Dr. AnandPandit form KEM Hospital, Pune, who was represented by Ms. BharatiPatil for having collaborated in this venture. Mrs. Chhabria was speaking in the distribution ceremony of the Cerebral Palsy chairs, wheelchairs and commode chairs. Satara’s District CollectorShri. AshwinMudgal, Chief Executive Officer of SataraZillaParishad Shri. Nitin Patil, Additional Commissioner of Pune Division Shri. Sham Deshpande, District Health Officer Shri. Dilip Mane, District Education Officer Sou. PunitaGurav, Managing Director of Cooper Corporation Pvt. Ltd Shri. Farrokh Cooper and CEO of the Cooper Corporation Pvt. Ltd. Shri.Zhal Cooper,Ruby Hall Clinic’s Dr. Purvez Grant,KEM Hospital’s Ms. BharatiPatil were present on the occasion. Presence of Satara’s MP Chhatrapati Udayan Raje Bhosale and his wife Chhatrapati Damyanti Raje Bhosale proved to be added feature of the program. The chairs were donated by Mukul Madhav Foundation, the CSR arm of Finolex Industries Limited. Out of the promised 314 Wheelchairs & Commodes & 100 Cerebral Palsy chairs, so far MMF have donated 74 wheelchairs and 52 commode chairs to these diagnosed children in Satara.A total of five wheelchairs, five commode chairs and one Cerebral Palsy chair were donated during the event held in Satara on the 4th of March. After having completed verifications, MMF will donate 36 Cerebral Palsy chairs by the end of next week to the ZilaParishad schools of Satara and will complete the remaining donations of chairs over the next 8 months. She appealed to the district administration to help MMF get these facilities to the needy children by arranging transport facilities for them to reach to this center from the far off places. Dr. Purvez Grant said, “I am happy for this venture. We have done several projects with Mukul Madhav in the past in Pune and are happy toprovide them with a special room at Ruby Hall Health Care Services in Satarato continue their good work”. The program was marked by some amazing dance performances by our special children moving everyone in the audience to tears and also a great show was put up by Piyush Malhotra Dance Academy.